Price: $19.99 or 1600 MSP – Purchase Here! Many people speak of the upcoming titles, the breathtaking leaps that the gaming industry is taking in the realms of animation and gameplay and the exciting things that are coming up for the world of gaming. Yet, stepping back into the stories of some of our past favourites is just something that never gets old (no pun intended) and developers are beginning to notice. Rather than blowing the dust of some of our out-dated systems, more and more of our favourite classics are being re-released onto the current consoles available. 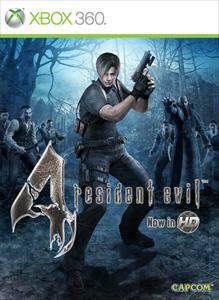 Capcom have noticed this trend and have followed with their own releases, including the re-release of Resident Evil 4. Taking a step back from the Nintendo roots for this particular title, it has managed to return to more suitable locations, rather than the more ‘family friendly’ Wii and GameCube. Although it was also released for PlayStation 2, but was met with critical reviews which favoured the Nintendo releases. Will Resident Evil 4 HD have players wishing for the days of the Nintendo systems or will all the upscale digital mayhem haven them foaming from the mouth? After the events and eventual destruction of Racoon City, Resident Evil 2 protagonist Leon S. Kennedy is recruited by the U.S Secret Service to act as the bodyguard to Ashley Graham, the daughter of the President. However just before he is assigned the role, Ashley is kidnapped and is tracked to a small rural village in Europe. 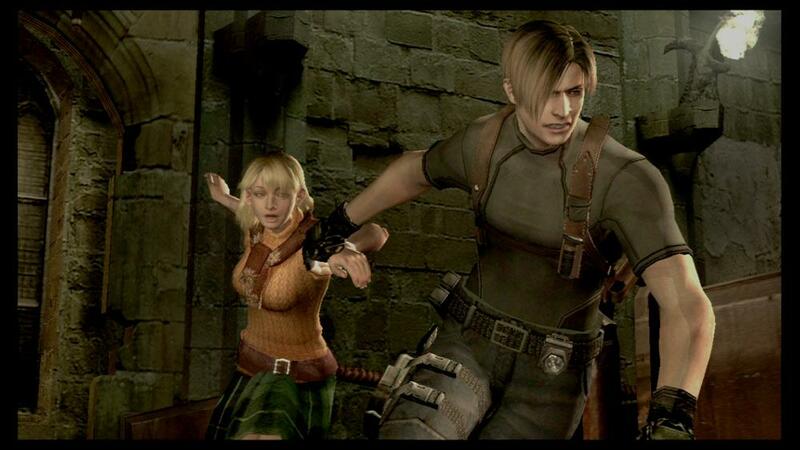 The game begins as Leon arrives at the village to rescue Ashley and investigate and eliminate those responsible. The villagers meet him with murderous hostility, outright trying to kill him and stop his advancement into the town. Leon finds the town taken over by a religious cult, who are using sinister means to control the minds and bodies of the people in the small rural village. There are mixed feelings about the story of the Resident Evil games, but I have to say, the depth of the plot makes the mindless enemies more than just senseless violence. The more information that is given makes the experience more terrifying, not knowing enough encourages characters hope, where the abundance of knowledge stamps out their ability to reason a way to survive. That makes the protagonist succeeding in the game so much more enriching, because you know the odds that have been beaten. 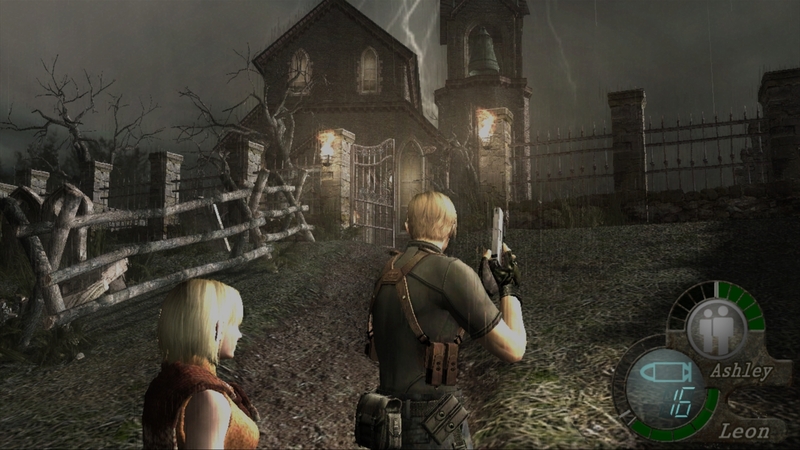 Resident Evil 4 was the beginning of a new style of gameplay compared to the titles of the past, moving from an almost birds eye 3rd person view to the over the shoulder camera that is stuck to the protagonists back. Since I had a horrible time trying to adjust to the old style (and in many cases ended up throwing the controller away in rage), it was exciting to have a crack at the newer views. It is a massive improvement, allowing for more precise aiming with use of laser targeting, allowing for most players to nail the illusive headshot. The controls are not what you would call traditional, being in that the triggers only pull out you weapons, and doesn’t actually shoot them. However players should be able to adjust fairly easily to the newer control layout. 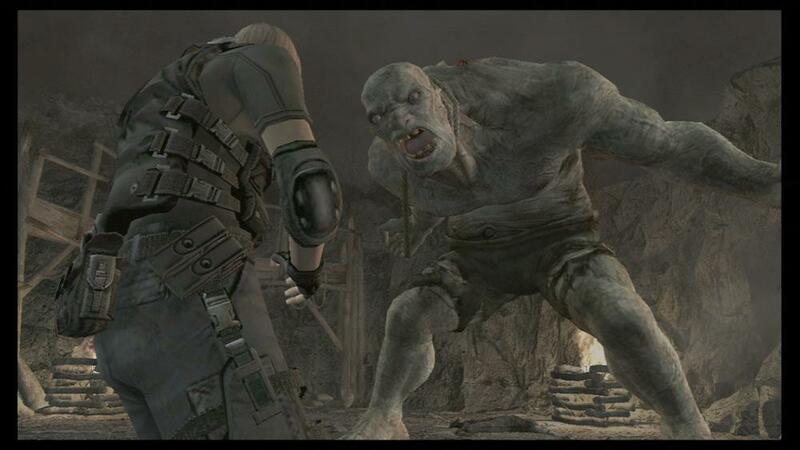 The big negative about the controls of Resident Evil 4 is the fact that you can’t walk and shoot at the same time. It is extremely frustrating trying to shoot a large ogre looking man who can crush you under his feet, then having to drop your aim, run away and quickly turn around and aim again. By that time, he is almost on top of you again! The inventory system in the game is very realistic and challenging, which is a refreshing change. Players have to be very careful on which guns, ammo and healing products they carry, because you are only give a certain amount of space to store everything. This also allows for the player to customize their pack to their own playing style, if they don’t use the shotgun very often (although who doesn’t love shooting with one and causing head explosions!) then they don’t have to carry one. Sell it and replace with maybe a rifle for long distance shooting. The pack size can be upgraded via the travelling merchant who appears periodically throughout the game to sell you weapons, weapon mods, healing items and will also improve your weapons for a price. 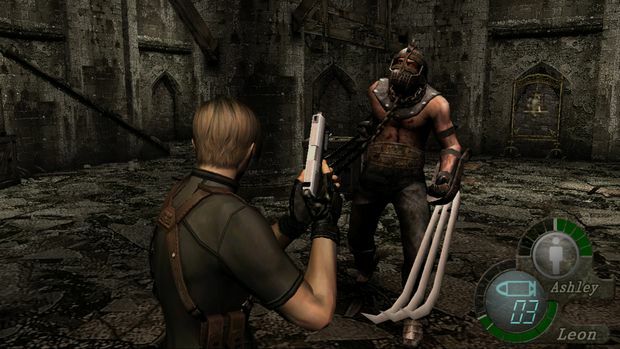 Resident Evil 4 was also the beginning of the quick response button presses, where your character must quickly push the buttons flashing on the screen to run, dodge or any action that needs to be done quickly. It is an excellent way to keep the player on edge; however in the HD release (although it may be the same for its predecessors) the buttons rarely changes. So if you know the player is going to sprint, you can automatically move your finger to the right button, before being asked to. It may have worth putting in some variation, just to keep things from becoming predictive. Not much has been added to the re-release of the game, it includes the bonus gameplay which was in the original release. ‘Separate Ways’ and ‘Assignment Ada’ are bonus missions that shows the story of Ada Wong’s involvement in the game, as well as ‘The Mercenaries’ mini game, where you have limited time to kill as many enemies as possible with a variety of characters. The addition of a leader board system is only beneficial to those gamers who have to be the best at everything, rather than actually enjoying the game. It allows you to compete with your friends on how fast you complete the title, but only for normal or professional difficulty. The player also gets the added bonus of achievement systems on the XBLA title, although they don’t stretch very far out of the imagination of the main storyline. Now with the HD title, there are some players that would expect big changes in the way the game is presented, that is not the case in Resident Evil 4. That is not to say the game looks bad, not at all. The animation is well done and consistent throughout the game, rather than having overdone cut scenes that leaves the player controlled animation a lot to be desired. Leon looks the same regardless if he is having a deep conversation with Ashley or if he is blowing the heads off the local populous. The background music throughout the game represents the mood well, but I believe the developers missed out on creating the jump out of you seat scares, because the music always lets you know when enemies are approaching. When the music begins, you can start looking for the enemies, so there is no evil villager that suddenly sneaks up on you unless, he just walks up behind you while you are shooting someone else because you cant move while you shoot. All in all, I thoroughly enjoyed Resident Evil 4 HD, the improved controls and smooth animation inspired me to dive deeper into the Resident Evil series altogether. The game would only need minor tweaking to achieve perfection, in making it less repetitive. If trying to decide whether to upgrade from the previous releases, it would be hard to say. I prefer the XBLA version because of the achievements, but otherwise there is not much difference. Cheout out other Capcom game reviews and news HERE!